October 1, 2018 – NASA’s Kepler team has received data showing that the spacecraft’s ability to point precisely has degraded. 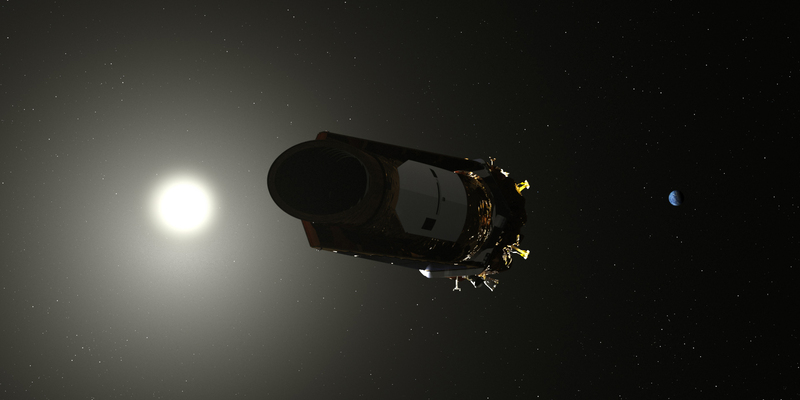 In order to preserve high-value science data collected during its latest observation campaign, the Kepler team has placed the spacecraft in a stable, no-fuel-use sleep mode. During Kepler’s allotted Deep Space Network time, scheduled to begin October 10, the Kepler team will “wake up” the spacecraft and direct it to point its large antenna back to Earth and transmit the science data home. Due to uncertainties about the remaining available fuel, there is no guarantee that NASA will be able to download the science data. If successful the Kepler team will attempt to start the next observing campaign with the remaining fuel. NASA anticipates that the spacecraft will soon run out of fuel, but it remains unclear how much remains. NASA’s goal is to collect and downlink as much science data as possible while the spacecraft remains viable. Kepler’s latest observing campaign, Campaign 19, started on August 29 after the spacecraft’s configuration had been modified in order to adapt to a change in thruster performance. Over the following 27 days, Kepler observed more than 30,000 stars and galaxies in the constellation of Aquarius. The stars included dozens of known and suspected exoplanet systems — including the well-known TRAPPIST-1 system with its seven Earth-sized planets. As engineers work to preserve the data stored onboard the spacecraft, scientists are continuing to mine existing data already on the ground. A recent notable find is Wolf 503b, a nearby super-Earth-size planet orbiting a bright star. At approximately twice the size of Earth, Wolf 503b is representative of the most common size of planet Kepler found in the galaxy. However, since there are no planets this size in our own solar system, we have a lot left to learn about planets this size. Since Wolf 503b is nearby and orbits a bright star, it is particularly well suited for subsequent observations with other telescopes that promise to help unravel the mysteries of what planets this size are like. Launched in March 2009, NASA’s first planet-hunter has confirmed more than 2,600 planets beyond the solar system.